Imam Hussein, the Prophet Muhammad’s grandson, is one of the most important men in history. Hussein is a universal figure of inspiration and it is an important objective to share about what he stood for and what he died for, with everyone. Imam Hussein was born in 620 AD to a family renowned for their values of love, equality and peace. He exemplified these morals – taught to him by his grandfather Muhammad, the last prophet of Islam. 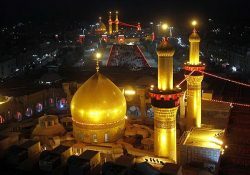 Being born into the household of Prophet Muhammad, the people flocked towards Hussein for his teachings, generosity and wisdom. He served the people as a leader – promoting and upholding many universal principles. Hussein valued equality, justice, and honour, and was known for his truthfulness and selflessness. Not long after the passing of Muhammad(PBUH), the leadership of the vast Arab Empire had fallen into major disrepute and corruption. The morality that Muhammad(PBUH) had spent his life instilling into society was slowly being eradicated as the new tyrannical ruler, Yazid, seized power. Imam Hussein witnessed how the fundamental human rights of his fellow citizens was being usurped, and knew something had to be done. Yazid, from the Ummayad dynasty, knew nothing of morality or humanity, and ruled with an iron fist. He demanded Imam Hussein pay him an oath of allegiance, to lend credibility to his tyrannical rule. It was now that Imam Hussein faced his dilemma… Should he give his oath of allegiance to an oppressive tyrant – stand aside and allow injustice to overcome morality? Or should he take a stand and risk great personal loss? The timeless words of his grandfather echoed in his heart and Imam Hussein knew what to do: The greatest stand is to speak the word of truth in the face of a tyrant. Whilst Imam Hussein was determined not to bow down to a tyrant, he did not want to create social disharmony, conflict or any bloodshed. He decided to relocate with his whole family to the holy city of Mecca. Surely, he thought, Yazid and his henchmen would respect this city and avoid confrontation. En route to Kufa, Imam Hussein received news that the people had been bullied and threatened into withdrawing their support for him… Imam Hussein, his family and his companions were alone with no support. Yet Imam Hussein was a man of principles – he would never give up his mission and bow to tyranny. Yazid ordered an army of over 30,000 to block Imam Hussein from moving any further east. Imam Hussein’s caravan was forced to stop in the middle of the scorching desert of Karbala, Iraq. The end was drawing close. The next day, under the blazing sun and searing heat, Yazid’s battle drums were sounded and orders were given to the army to attack and kill Imam Hussein at any cost. Imam Hussein’s army of approximately 100 men stood in front of an army of 30,000; the odds were impossible. One by one, Imam Hussein’s men, family and children sacrificed themselves to defend him, until he stood alone on the desert plains…That night, Imam Hussein assembled his companions and pleaded with them to leave him and save themselves. They refused to leave their leader, declaring that they would prefer to stay and die with him on the path of truth and justice. They took comfort in defending a noble cause. Shortly afterwards, the heartless enemy army encircled Hussein and he was ruthlessly killed and beheaded. It was the tenth day of the first month of the Islamic New Year, the 10th of Muharram 680 AD, Ashura day. Today, the tragedy of Karbala is remembered by millions worldwide every year in solemn commemoration. It is a time of introspection and internal contemplation, a time of re-dedication to the spirit of Imam Hussein. People reflect upon and reject elements of their lives that mirror the uncivilized tendencies of Yazid… And they vow to become more like Imam Hussein in their principles. In many societies, like Europe and North America, a custom has developed of setting up blood donation centres in the name of Imam Hussein. Donors give with the sole purpose of helping others who need it – it is just one way in which the sacrifice of Imam Hussein has become a symbol for courage, selflessness and ultimately, humanity.